This book is structured as a mix-tape, and each story a song. The entire novel is set in both Russia and Chechnya over the past century. Marra introduces characters who reflect and question the political and social landscape of their time. Though it is a collection of stories, every tale pieces together and forms an atypical, a-chronological, and stunning novel. In each story, a character believes they can erase a person, a transgression, a guilt, or themselves—all to no avail and no relief. The final story, appropriately titled, “The End,” has a young soldier named Kolya experiencing his own death. And you realize, that although many people in the novel die alone, they are not without the comfort and companionship of memory, whether it be spun from desire or their last known truth. 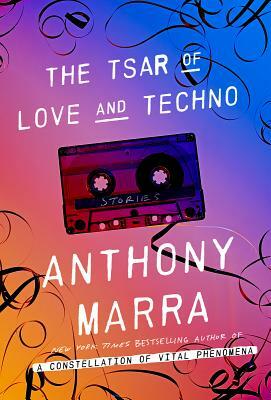 The Tsar of Love and Techno not only made me mourn for the characters, but for the discrepancies in written history and the holes that will never be filled. "Private acts of dissidence (a smuggled mix tape, say) become heroic in Anthony Marra's era-spanning portrait of the USSR." "Some books are love at first read, and this is one of them. Anthony Marra, author of A Constellation of Vital Phenomena, delivers his first collection of intimately tied stories (it kind of reads as a novel, actually), arranged into Side A and B and Intermission. With language as precise as a razor blade, Tsartakes us throughout Russia from 1937 to the present with a connected group of characters who, through their explosive escapades, demonstrate the peculiarities and nuances of life. It has everything: humor, action, suspense, drama — I'm going to go ahead and call it brilliant." "Marra, in between bursts of acidic humor, summons the terror, polluted landscapes, and diminished hopes of generations of Russians in a tragic and haunting collection." "With generosity of spirit and a surprising dash of humor, these artfully woven narratives coalesce into a majestic whole." “Powerful…strikingly reimagines a nearly a century of changes in Russia. [T]he book’s brilliance and humor are laced with the somber feeling that the country is allergic to evolution." "Love and betrayal reverberate through these nine deftly linked stories... With this collection, Marra has created a stunning portrait of a place and its indelible inhabitants."